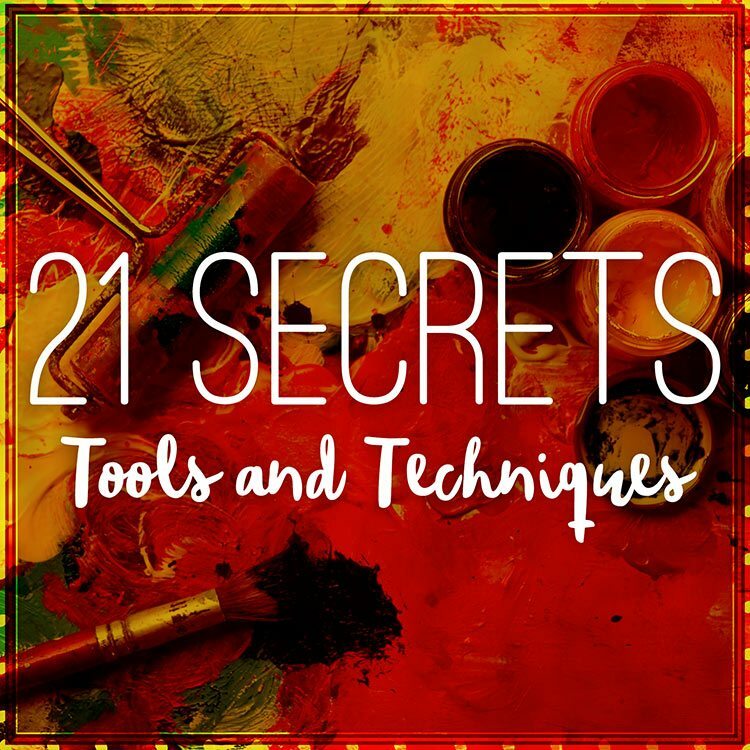 Below is the list of talented artists teaching in 21 SECRETS Tools and Techniques. Click on their name to visit their website. CLICK HERE to return to the 21 SECRETS Tools and Techniques sales page. 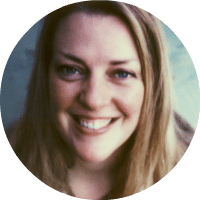 Amy Maricle is an artist, art therapist, blogger, and author in the Boston area. Amy’s approach to art journaling is playful and intuitive. Working in layers, her pages evolve slowly over time, with a variety of painting, printing, drawing, sewing, and creative writing techniques. 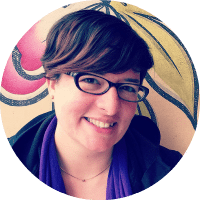 Amy is dedicated to empowering people to live a full creative life and use art as a form of self-care. I was born in Kazakhstan, and have spent the past 16 years in South Africa. I speak both Russian and English. I have 3 years art training in still-life watercolours. At 20 I graduated as a school teacher, and at 29 became a professional filming editor. My conventional art education enabled me to go on a self-taught journey of discovering mixed-media art, but the move from still-life to faces was not effortless and took several years of searching for my own style. At 35, I left editing and became a full-time artist. Besides my passion for mixed-media and fine art, I have always been smitten (and side-tracked) by varieties of crafts, such as bookmaking, doll sculpting, vintage repurposing, mosaics, pewter, sewing, and many more things. I have released my 1st online workshop in September 2015, called “Soulful Art With A Story”, and my background of art training, teaching and filmmaking made it an easy transition for me. 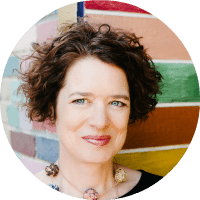 As a natural born creative, Ardith has spent the last 14 years tapping into the realm of painter, writer, teacher, and business woman. After facing medical issues that caused her to leave the teaching profession in 2003, she turned to art as part of her healing process and to have a creative outlet. At the time, she wasn’t a painter….just someone who loved to be creative. Today, she runs a successful full time business as a painter, teacher, and writer and teaches children as an art specialist in grades 3-6. 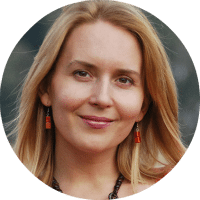 Her belief is that we all are creative beyond what we know, and her passion is to help those who seek that creativity and its pathways to freedom, to find them. Ardith teachers nationally in workshops, online, and locally in her community along the Gulf Coast of Alabama. 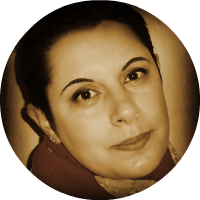 Catherine is a mixed-media artist who is passionate about all things art related. In 2005, she decided to leave the corporate world to pursue the creative life and has never looked back. Her passion started at a very young age with drawing and cartooning which has now evolved into art journaling and mixed media. She has been blogging since 2006 and in 2008 created her Youtube channel, Créations CeeCee, because she wanted to inspire others to express their creativity. Her motto: Create for yourself, share with others. 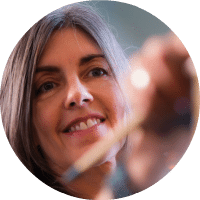 With 20+ years of experience teaching art and working as a full time artist, Connie Solera combines an intuitive approach to art making with a practical, traditional twist to it. Through Connie’s workshops, retreats, and mentoring she helps artists dig deep, experiment wildly, and learn new techniques and approaches that will excavate their innate gifts, enhance their unique strengths, and help them thrive as heart guided artists. Connie Solera is the founder of 21 SECRETS and super excited to be teaching in it again as well! I am a mixed-media artist and teacher. I love everything about art: creating it, thinking about it, looking at it, and teaching it. I teach both in-person and online workshops. I have been scrapbooking since 1995, stamping since 1996, and art journaling since 2004. I have kept a personal journal since I was nine years old. I believe in writing yourself down, expressing yourself, and making your mark on the world. As a Ranger Signature Designer, I design a line of mixed-media art supplies that includes acrylic paints, mediums, brushes, rubber stamps, stencils, and more. Look for the Dina Wakley Media Line by Ranger at a store near you. My two books Art Journal Freedom and Art Journal Courage are available now. You can also buy my DVDs and digital downloads online at North Light Shop. My name is France, but I live in Belgium with my 2 kids, my 2 mares, dog and cat. Though I started scrapbooking in 2001, I’m a full time mixed media artist since 2010. The mix of soft grunge, color and rusted or vintage embellishments are the main ingredients of my tags, books, altered art and art journaling. I like to play with inky techniques, just like a writer juggling with words. In my classes and tutorials, these techniques allow me to offer a comfort zone to the participants, while guiding them to tell their own story, to reveal their own creativity. Being on the design team of Mixed Media Place and being Brand Ambassador for the Finnabair brand and ColourArte, I enjoy sharing all things artsy with the people around me. Sharing is such an important part of art to me, that teaching classes doesn’t feel like enough. So in November 2011, I started a video series on YouTube called ‘Journal on Monday’. We celebrated the 100th episode in August 2014 and to this day, a new video is added on a regular basis. As my artistic occupation was growing, I started an art association with two artsy friends, have designed stamps collections for Stampotique, and have my own Primary Elements pigments color kits with ColourArte. I’m a beauty unveiler, light huntress, moment caresser and visionary poetess working with photography, painting, journaling, tarot reading and whatever else sings to my soul. Ultimately, all of my work is about helping people peel back the layers to experience the intense beauty of each moment allowing access to both their intuitive wisdom and a deeper connection to spirit and self. I was born in Sydney, Australia and spent most of my childhood there. Life in Sydney was amazing and I grew up doing Art in the Aussie sunshine! You could usually find me in the garden painting, drawing or reading. We had the opportunity to travel overseas often and this inspired me greatly. I have a deep love of adventure and travel! My father was transferred back to the States in my Junior year so I ended up finishing high school in Connecticut. Being six feet tall and having an Australian accent, it was tough to fit in but I found my home in the AP Art room and owe so much to my amazing Art Teacher! After graduating, I went on to attend the Ringling College of Art and Design in Sarasota, Florida and received a BFA in Illustration. After living in several cities, I found my home in beautiful, Portland, Oregon. My husband, Chris and I have been here for 13 years now and it has been the perfect environment in which to grow our family. We have two daughters, Grace and Claire and a cat, Toby. Since graduating, I’ve had many different jobs – interior designer, skin care creator and antique shop owner but none of these quite fit. Now, as a full time artist and teacher I have found my true place. I have come home to Art and I’m here to stay! Jessica Sporn, former lawyer and actress – now artist and mother, has been drawing and painting for as long as she can remember. 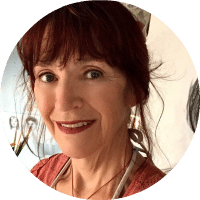 She is an accomplished, self-taught, mixed media artist whose style is colorful and ranges from whimsical to spiritual with a strong Folk Art influence. 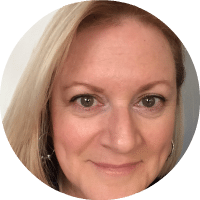 She hosts a successful Meet-Up group with monthly classes in her Montclair studio, and also teaches for The Ink Pad in New York City, and Art-Is-You Mixed Media Retreats. Her designs may be found world-wide on greeting cards, fabrics, and tabletop ceramics. Jessica is proud to design stencils for Stencil Girl Products and stamps for Rubbermoon. 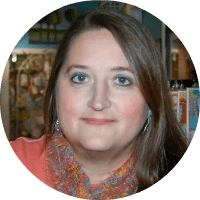 Jessica keeps an active blog and is represented for licensing by Creative Connection, Inc.
Jodi Ohl is a self-taught mixed media artist, originally from Dunkirk, NY, who now resides in Aberdeen, NC. Having recently left her day job to pursue her artistic career full time, she is has built a body of work that is known for its distinctive texture, bold color combinations which are often whimsical or abstract compositions, as well as motivational in nature. Her art appeals to those that seem to be young at heart and who appreciate the positive side of life whether communicated through words, colors, or composition. Published in over 23 international mixed media magazines such as Cloth Paper Scissors, Somerset Studios, Artful Blogging, Artful Journaling Somerset Holidays and Celebrations, and Cloth Paper Scissors Studios, as well as a contributor to five mixed media books. In 2014, Jodi’s painting, “It’s Not Complicated” (part of her Pod and Portals collection) was juried as one of the best of Mixed Media and featured in “Incite 2″ by Tonia Jenny of North Light Books. 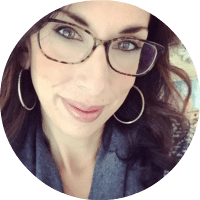 Jodi enjoys writing about her art and sharing the love of healing and motivation through creativity. She is represented by regional galleries in North Carolina and several others along the East Coast. 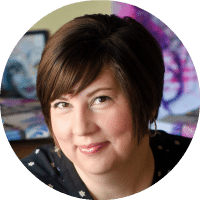 She is a popular mixed media art teacher online and in person, teaching at both large and small, local and national workshops around the US. When not painting, she enjoys time with her two sons, as well as other friends and family. Look for a new book by Jodi scheduled to be released by North Light Publications, in the latter part of 2016. Jodi welcomes visitors to her blog Sweet Repeats where you can find a full listing of classes, weekly musings, and additional artwork for sale. 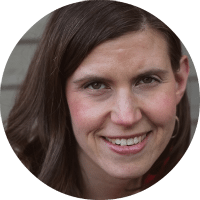 Lisa Cheney grew up in Eastern Idaho, moved briefly to San Diego, CA, and currently lives in Boise, Idaho. She received her Bachelor of Fine Arts in Graphic Design and Illustration from Boise State in 1996. 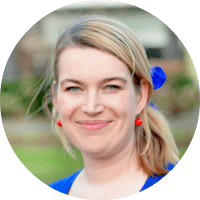 She now enjoys the freedom of freelancing as a Graphic Designer/ Illustrator and teaches bookmaking and Visual Journaling workshops throughout the North/ Southwest. Her visual journals have been published in 1000 Artist Journal Pages, Art Journaling Magazine, 1000 Artists’ Books, An Illustrated Journey – Inspiration From the Private Art Journals of Traveling Artists, Illustrators and Designers by Danny Gregory, and as the featured artist in A World of Art Journals. 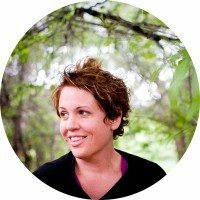 In addition to Visual Journaling and Bookarts, Lisa works in many other mediums including painting (watercolor, acrylic, oils, and encaustic), drawing (graphite, ink, mixed media), and printmaking. Hello, I am Marieke Blokland a.k.a. Bloknote, a mixed media artist, designer, author and art journaler from the Netherlands. Art supplies are my big passion. Professionally I would call myself an independent art and craft expert. But between you and me… actually I am just an art supply nerd. I own an online mixed media school called Bloknote Academy, where I sell fun art journaling and mixed media workshops. Each day I am growing as an artist, deeply thankful for everyone who believes in me and allows me to do what I do best, which is: teaching and inspiring people how to use art supplies, through fun and uplifting art workshops. According to me, people who are able to express themselves through art, are happier and more colorful people. It is not about being able to draw. It is about knowing how to use the tools and not being afraid to use them. If more people would grab a pencil fearlessly, the world would become a happier place. Marla has been a professional artist for over 30 years. A prolific painter and teacher, she is represented in galleries throughout the country and a contributor to many art publications such as Pastel Journal. 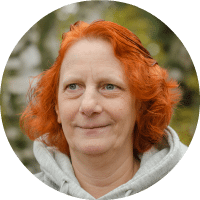 She is a signature member of PSA and a Master Circle in IAPS. She is well known for her 100 Variation Series and is sought after nationally as a workshop instructor. I am a writer, a teacher, a finder of magic, and the author of the inspirational novel: Unfurl. At the beginning of 2015 my husband and I took a huge leap of faith and followed our hearts and our dreams from the UK to southern Costa Rica. I believe in words as spells, the healing power of tea, that beauty is transformative, and that we are all tiny pieces of the Divine having a human experience. When I am not helping to create our dream space, listening in awe to Howler Monkeys, or learning how to trap spiders under Tupperware, I can usually be found dreaming up new places to lead retreats and writing my next book. I am an Artist. I paint. I draw. I tell stories. I put them together and make art. Each and every art piece is created with great respect and compassion for my subjects whether they emerge from within my imagination, appear in a dream or show up in person unexpectedly. I paint using the traditional art mediums of brush, paint, easel and canvas as well as with my iPad, a stylus and printer. Art challenges my thinking, stirs my heart’s desires and creates momentum for change. My art deeply influences my internal world and my outer life. It’s a glorious awakening filled with love and doubt, dread and courage and potential for growth. Sandra Duran Wilson is a mixed media painter and sculptor. 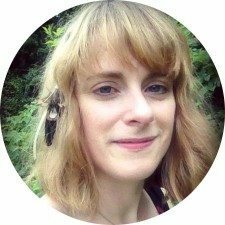 She has degrees in fine art and science and has written 5 books on art techniques. Her work is represented in the US, Europe and Australia. She uses her background in experimental science to develop new ways to work with mixed media. I’m a mixed media artist living in Minnesota and have my hands into almost every medium. Just follow the paint splatters and you’ll probably find me. Art journaling is where everything starts with me and is my true passion. While I love to paint and work on canvas or other substrates; journals hold my heart. It is an activity I’ve relied on since childhood. My early journals were just notebooks but I filled them with my hopes and dreams. I poured my soul into them and I still do. I learned how to make my own journals about 8 years ago and have not purchased a journal since. I think of myself as a journal ‘constructionist’. I’m always thinking about different ways to make a journal unique. I’m never satisfied with what is a typical bound journal; pages between 2 covers. I want my journals to be a surprise for me as well as anyone who encounters one. I want them to wonder about what it is and what it holds. My journals almost always hold a secret section or more than a single spine. Mystery and intrigue resides among the pages and are meant to be explored. Since my journals are so unique they are often quite impractical but if I think I can make something work as a journal I don’t think twice about trying. I want them to be a challenge which makes me excited to fill them. Every page offers an adventure and has to be explored. Tori Weyers was born in Indianapolis, Indiana in 1978. Weyers is a fine artist and designer specializing in illustration, mixed media and abstract painting. 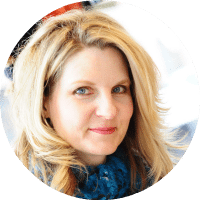 She received her BFA from the Art Academy of Cincinnati and has been working as a professional artist and designer since 1998. Her work has been published in Somerset Studio’s Art Journaling Magazine and F&W publication’s How Design Magazine. She has shown her work in many galleries regionally and throughout the Indianapolis area. Weyers is a featured artist at the Sideshow Art and Auditorium gallery in downtown Indianapolis. 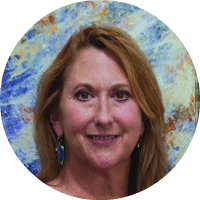 She teaches mixed media, painting and printmaking at the Indianapolis Art Center as well as project based classes at Nickel Plate Arts in Noblesville, Indiana. Her artwork has been collected throughout the United States and the world including, Canada, Australia and the Netherlands. You can purchase original work and prints from her Etsy store or visit her in downtown Indy on a First Friday open studio night at the Circle City Industrial complex. Hi! I’m Violette. I am a mostly self-taught artist, cartoonist and illustrator who specializes in Art Journaling and joyful living. I like to fly my freak flag loud and proud by living in a purple magic cottage and dressing in fun clothing. I’ve been blogging for over 11 years sharing my creative life with my tribe of friends and encouraging them to embrace their creativity and not be afraid to be themselves no matter what age. I’m the author of the book: Journal Bliss: Creative Prompts to Unleash your Inner Eccentric. My work has been featured in numerous books and magazines. My funky magic cottage has appeared on several different TV shows. On my Youtube channel you’ll find many DIY videos and soon an “ask Violette” weekly video show. 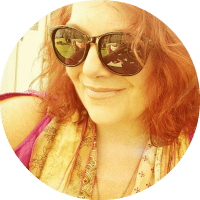 I teach online workshops and offer mojo sessions helping creatives “get their mojo going”! When I’m not arting I can be found having adventures in forests (real and make believe) with my 3 grandsons! 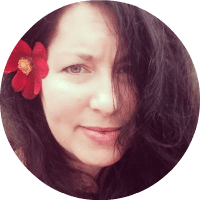 Hali Karla is an artist and guide passionate about cultivating holistic creativity as a way of navigating life and relationship. 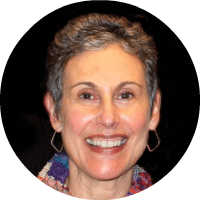 She enjoys gathering visionaries for workshops, collaborations and circles that inspire self-acceptance, celebrate wholeness and honor the mystery of interconnection. Her soulful perspective and therapeutic background offer a meaningful framework for both her imagery and how she guides others, which has been described as evoking a sense of the sacred, and nurturing safe space for truth-telling and courageous transformation. 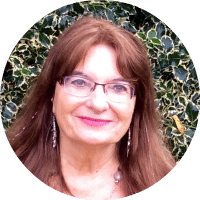 She encourages trust in the mind-body-spirit-nature of each individual, as well as intentional relationship with creative energy and intuition as a way toward empowered healing, vitality and joy. The creative process and her daily practice guide and ground her life and work in the world.